In late January 2018, the media reported that India is finalizing a document with France (apparently it would become official in early March during a visit by French President E. Macron to Delhi) on military logistics similar to the USA of August 2016, according to which the Indian fleet can use military installations in both Diego Garcia and Guam, as well as other bases in different regions of the world. It was signed after 10 years of difficult negotiations. And it seems to be contagious – the agreements with Paris will also open doors of French bases to the Navy ships of the Republic, especially in the Indian Ocean. But admittedly, this decision of the French side is not so genuine. A few months after the signing of the agreement between Washington and Delhi in April 2017, India received a similar proposal from Australia, which even presented a draft of a future document and has an accumulated long-term experience of implementing such agreement with the United States. Today, this step was prompted by the growing concern over the marked intensification of the Chinese fleet in the Pacific and Indian oceans, especially at their junction, and in waters near the fifth continent. Thus, the Executive Director of the Australian Strategic Policy Institute (ASPI) Peter Jennings drew the attention of experts to the appearance of not individual Chinese diesel submarines, but several flotillas with different types of military vessels. This fact was confirmed by air photographs taken on January 2, 2017. And the senior analyst of the same institute, E. Berger, noted that the Chinese, having opened a first full-scale overseas base in Djibouti in August 2017, intends to create the same near the modernized port of Gwadar soon, which can also be easily transformed into a military base that is logical in connection with the objectives of the “One Belt, One Road Initiative”. Controversy is evoked concerning active collection of intelligence on the possibilities of participants in various sea maneuvers (e.g. RIMPAC), which is carried out not only by Chinese warships but also by the research vessels. The latter are increasingly dispatched by Beijing to study the bottom of Antarctica as well. And this could mean the close coordination of the Chinese military with the State Oceanic Administration, as well as their greater involvement in the Antarctic, a seemingly peaceful program. Apparently, a lengthy discussion, not devoid of slyness, about whether or not to have foreign bases concluded in Beijing. Since 2015, large-scale plans to find new firm bases and ports that the Chinese would like to “develop” appear regularly in the Defense departments. Specifically, Chongjin (North Korea), Port Moresby (Papua – New Guinea), Sihanoukville (Cambodia), Koh Lanta port (Thailand), Sittwe (Myanmar), Dhaka (Bangladesh), Lagos (Nigeria), Mombasa (Kenya), Dar es Salaam (Tanzania), Luanda (Angola), Walvis (Namibia), Maldives, Seychelles, etc. Later it expanded and can also be pointed at Laem Chabang in Thailand, Batam in Indonesia and others (more than 18 zones in the Indian Ocean area alone). By the end of 2015, the establishment of port networks between 10 Chinese and 5 Malaysian ports was announced. Several more are planned next in line to its connection -Kuantan, Melaka, Kedawang, etc. The ports of Australia- Williamstown, Langbridge (near Darwin), Kunavara, Townsville and others were not neglected, in which Chinese investment companies actively rebuilding the infrastructure, thus preparing a platform for strategic needs including for Maritime Silk Road (MSR) etc. As a rule, they are all located near military bases or facilities of Commonwealth of Australia or the USA. According to the estimation of a well-known specialist B. Hertz, Beijing in total intends to implement the «One Belt, One Way» project along the maritime and land lines- an extensive program of construction of military bases on the territories of more than 60 states of Asia, Europe and Africa. In response to the appeal of the Australian authorities to strengthen “military-to-military” relationship through the proposed LEMOA pact. In the face of Beijing’s activism and certain aggression in the region, India said that it will refrain from the final decision for the time being since it would like to reach an operational level of such an agreement with Washington initially, and then raise the question of adopting other documents of this kind with other partners. With regard to the logistics agreement with Paris, it will allow India to gain access to the base of Réunion, not far from Madagascar, as well as to the French military facilities in Djibouti in the Horn of Africa, i.e. in important areas on the western flank of the Indo-oceanic zone. Almost simultaneously with the development of the agreement with France in New Delhi, the possibilities of projects for the creation of bases in Oman and the Seychelles were taken into consideration. In fact, on January 29, 2018, India established an agreement with the Seychelles authorities on the construction of military infrastructure (pier for warships and a runway for large aircraft, but without nuclear weapons on their sides) on Assumption Island and access to their use in the future. 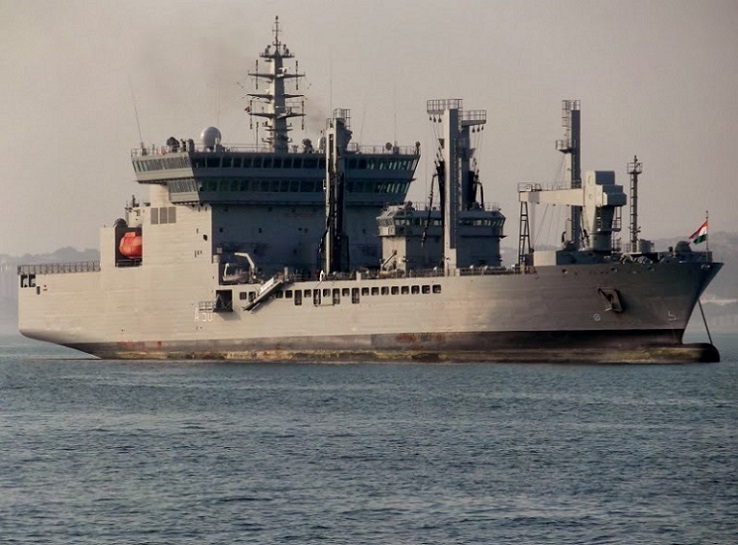 On the east flank of the Indian Ocean, during the November 2017 meeting of the “Dialogue of Defense ministers”, India successfully signed an agreement with Singapore on expanding bilateral cooperation at sea, in particular the deployment of floating platforms and access to local military facilities (especially the Charjee Base) for a longer term, as well as joint maneuvers and extensive maritime observation missions of the Navy and the Indian Air Force in the South Korean and Andaman Seas. India’s new capabilities in its strategy of strengthening its position under the slogan “Indian Ocean should be Indian” will significantly expand the network of strong points and bases that were built earlier: an interception station in Madagascar linked to similar ones in Kochi and Mumbai; GME in Farkhor or Ayni (Tajikistan); access right to Vietnamese ports and certain military facilities; Radar installations on all 26 Maldives atolls associated with Indian radar systems. In addition, it is necessary to take into account the developing of extensive military and technical ties with Mozambique, Qatar, the construction of a satellite tracking centre in southern Vietnam, the protection of EEZ of island states, counter-terrorism measures, arms shipments to Nepal, Bhutan and other countries. Undoubtedly, it is necessary to completely understand the difference between full-scaled military bases and strong points or separate military constructions, whose access or own construction is being targeted by the two Asian giant rivals. However, we cannot fail to acknowledge the increasingly harsh nature of this rivalry. A vivid example of their confrontation is the unpredictable situation in the Gulf of Oman around modernized ports of Chahbahar (India) and Gwadar (China). In January 2018, news broke out about Beijing negotiations with Karachi on the construction of a second foreign base in Jiwani on the border with Iran, which is 85 km from Gwadar. Evidently, this paradox testifies not only to the raging “race for bases” in the Indo-oceanic zone, but also the apparent attempt by the Chinese military to copy the well-known Pentagon strategy “Pax Americana” to protect free trade and support global stability with the help of military bases located along strategically important lines of communication (SLOCs). According to the opinion of some experts, the Chinese model should probably be named as “Pax Sinica”. It can be assume with great certainty that India will give its adequate response – approve an agreement with France in March 2018 on LEMOA and will continue to look for new strong points and the next candidate for a similar agreement. For instance, the UK, which by the way, in late August 2017, signed a memorandum of understanding with Oman on the access to military facilities in the Duqm port building a base for supporting joint logistics. This will be a strategic factor for the London restored course “to East of Suez” outside the Persian Gulf, as well as for joint maneuvers including SAIFSAREEA-3 in 2018. New and previous strategic opportunities of Britain in the region are at the mercy of India. And whether there will be a winner in the next round of “race for bases” or the search for other partners in LEMOA, only time will tell.